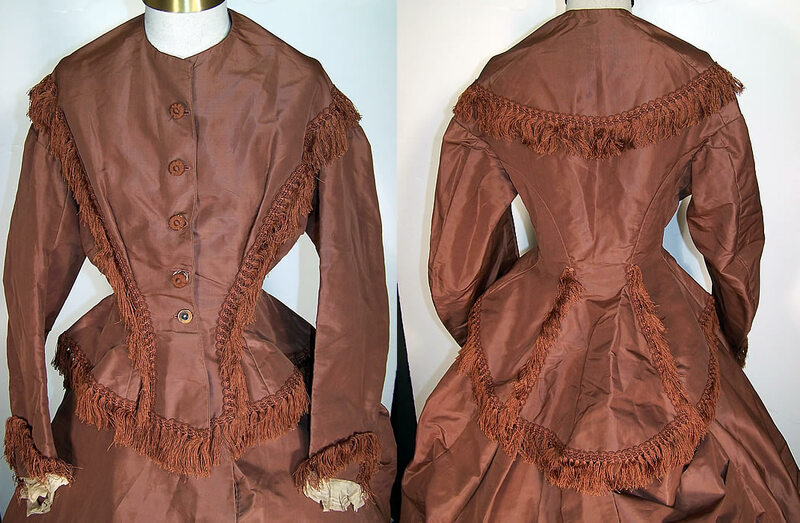 This antique Victorian era brown silk, fringe, bustle hoop skirt apron, bodice, day dress dates from 1870. 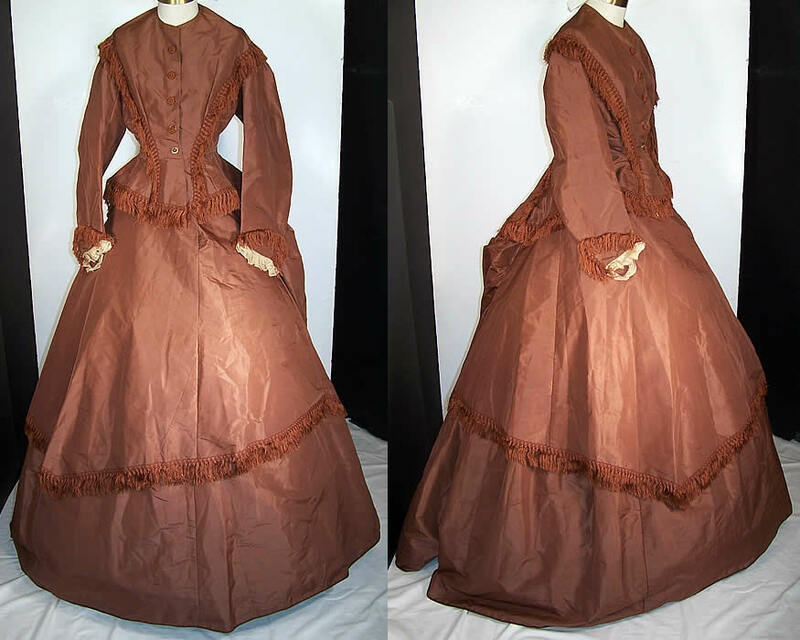 It is made of a chocolate brown color silk taffeta fabric, with brown silk fringe trim edging. This beautiful bustle visiting gown travel day dress has a form fitting, long waisted, cuirass bodice, with a peplum skirted waist, fanned back drape, rounded high neckline, long narrow sleeves, with white lace trim cuffs and silk covered buttons down the front for closure. It is fully lined in a brown polished cotton fabric, with stays boning sewn inside the front only. The bodice measures 20 inches long in the front, 25 inches long in the back, with a 22 inch waist, 34 inch bust, 14 inch back and 21 inch long sleeves. 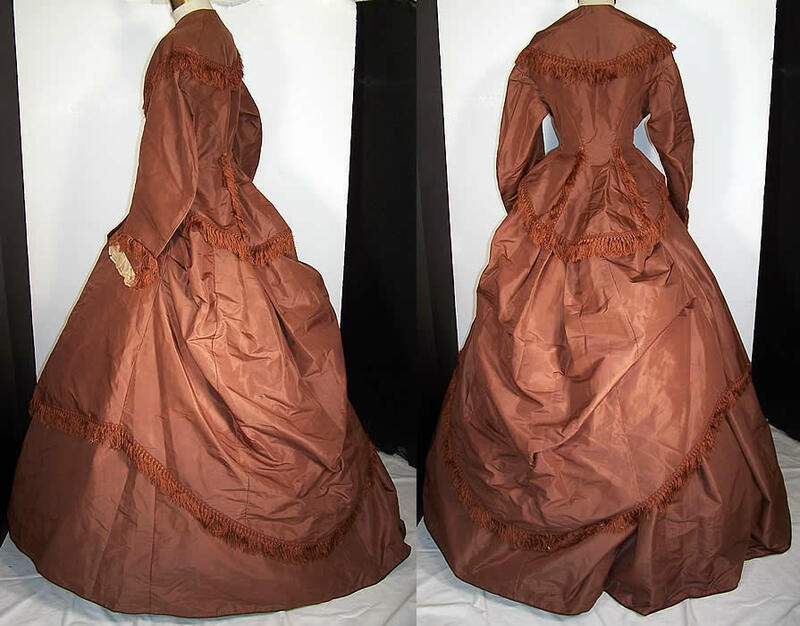 There is a matching long, very full, floor length hoop skirt, with pleated gathering on the back waistband, lined in a brown polished cotton fabric and measures 44 inches long, with a 26 inch waist. Also included is a matching elaborately draped overskirt apron, with fringe accents and a bustle back flounce drape. The overskirt measures 33 inches long in the front, 44 inches long in the back, with a 28 inch waist. This outstanding three piece outfit has wonderful quality workmanship and design style. It is in excellent wearable condition, with only some faint underarm discoloration and the buttons are a bit a loose, with one missing the fabric covering.